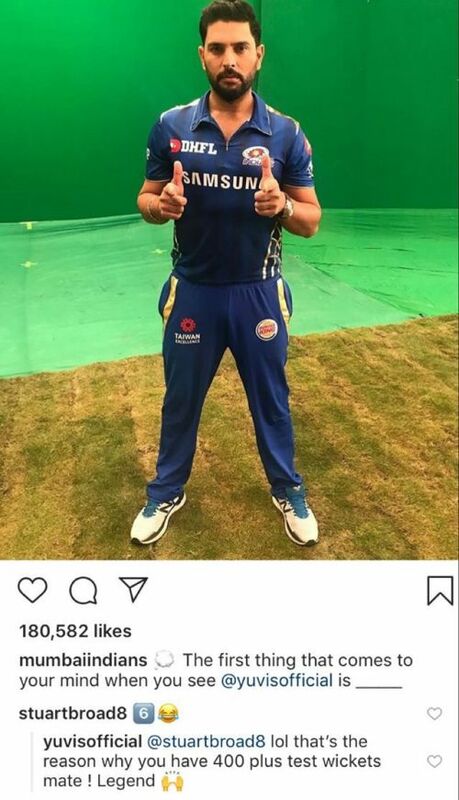 Star Indian all-rounder and Mumbai Indians' new recruit, Yuvraj Singh, engaged in a hilarious banter with Stuart Broad on Instagram. 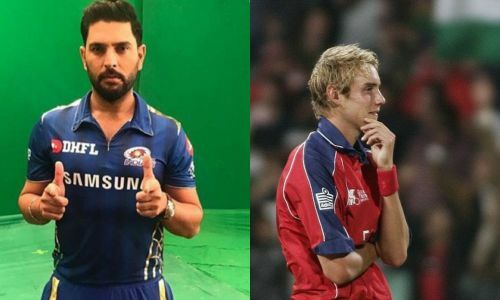 Yuvraj Singh and Stuart Broad need no introduction in world cricket. During the inaugural ICC T20 World Cup at South Africa back in 2007, Yuvraj Singh grabbed the headlines by smashing six sixes in an over off Stuart Broad, when India and England encountered each other at Kingsmead, Durban. Since then, we have witnessed several 'friendly banters' involving the famous duo. Yuvraj, who has so far played for the Kings XI Punjab, Pune Warriors India, Royal Challengers Bangalore, Delhi Daredevils and Sunrisers Hyderabad in the IPL, will be donning the blue jersey this season after being bought by the Mumbai Indians at his base price of INR 1 crore during the auction held at Jaipur, on December 18, 2018. Stuart Broad is England's second highest wicket-taker in Tests with 437 scalps to his name in 126 matches. Apart from acquiring the services of Yuvraj Singh, the Men in Blue further strengthened their squad by roping in players like Lasith Malinga, Quinton de Kock and Jayant Yadav for the upcoming edition of the IPL. They also bought domestic talents like Barindar Sran, Anmolpreet Singh, Pankaj Jaiswal and Rasikh Dar during the auction. The three-time winners will begin their 2019 IPL campaign against the Shreyas Iyer-led Delhi Capitals side their home, the Wankhede Stadium, on March 24th.